President Barack Obama (lead image, left) and his advisors (right) spent at least a week, and as much as three weeks, planning to send up to 9,000 combat troops into eastern Ukraine, on the border with Russia, following the shoot-down of Malaysia Airlines Flight MH17 two years ago. The scheme, which was to have involved Dutch and Australian army units, with German ground and US air support, plus NATO direction, has inadvertently leaked from the publication of a report this week by a former Australian Army captain. According to Dutch sources, the military plan of attack was aborted when Germany refused to participate directly, or allow its bases and airspace to be used. Dutch Prime Minister Mark Rutte announced the Dutch were pulling their troops out of the plan on July 27. He said at the time: “Getting the military upper hand for an international mission in this area is, according to our conclusion, not realistic.” That was ten days after the MH17 crash. But Australian Prime Minister Tony Abbott and his cabinet continued, Brown and his sources reveal, to plan the operation with the US for another 10 days. MH17 was shot down on July 17, 2014, killing 298 passengers and crew. Of the lives lost, 193 of them were Dutch; 43 Malaysian; and 27 Australian (plus 11 dual nationals or residents). 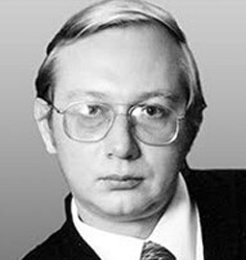 From the first hours, the Malaysian government suspected elements of the Ukrainian military had been involved. Kuala Lumpur was reluctant to endorse the claims of the Ukrainian and US governments that Russia had been culpable, and that Russian-backed forces were directly to blame. That story can be read here. The Dutch and Australian governments were, and continue to be, the most supportive of blame for Moscow. This was adopted as the official policy of the European Union (EU) states when they joined the US in introducing new sanctions against Russian oil companies and banks between July 16 and 31, 2014. For more details of the disagreements between political leaders on what had caused the shoot-down, read this. Rutte and Abbott combined to pressure Prime Minister Najib to drop his public scepticism, and join the police and prosecutors group known as the Joint Investigation Team (JIT). Najib is the only one of the three to discuss with Russia its assessment of the causes of the MH17 crash. 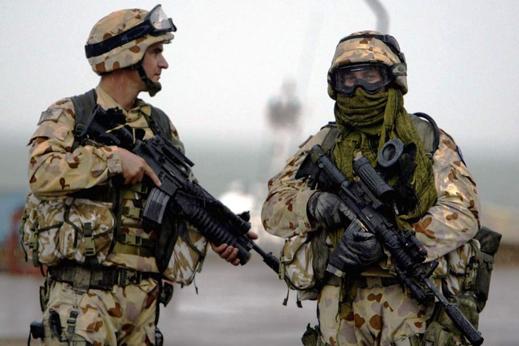 The report by Brown (pictured right) was cited in an Australian newspaper on Monday as an attack on ex-prime minister Abbott for “grand aspirations [which] could have exposed Australian troops to substantial danger in pursuit of lofty objectives misaligned with national interests”. Abbott lost his job when the MPs of his party combined to replace him with the current prime minister, Malcolm Turnbull, on September 14, 2015. 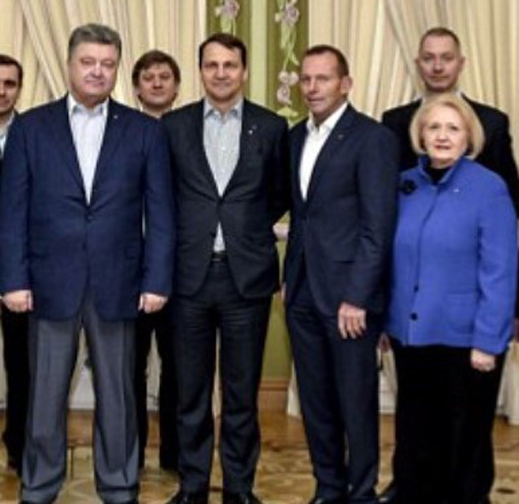 Ukrainian President Petro Poroshenko then appointed Abbott one of his “international advisors”. 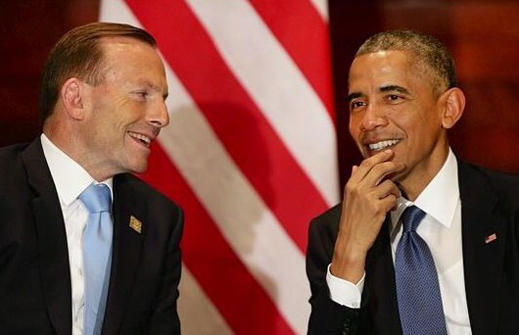 In 2014, according to Brown, Abbott “calculated that the best way to encourage the United States to retain an active role in world affairs was for Australia to lead by example: as an ally encouraging, reassuring, and perhaps even occasionally shaming the US into taking action.” The full Brown report can be read here. Brown reveals that “military planners worked up options for Abbott that involved deploying up to a brigade’s worth of troops to Eastern Ukraine, a formation of as many as 3,000 troops”. Another proposal, which he reports as coming from Abbott’s office, was “to commit uniformed Australian military logistics personnel to help the Ukrainians improve their own systems”. Poroshenko (left) meets in Kiev with his international advisors (centre to right): ex-Polish foreign minister, Radoslaw Sikorski; Abbott; and Melanne Verveer, a Ukrainian-American protégée of Hillary Clinton. 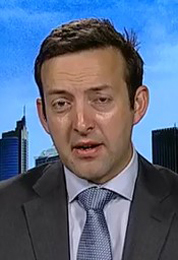 Brown, who favours special forces operations himself and the command of the Australian Army by former spetznaz officers, says “nearly 200 [special force troops] were eventually sent to Europe to support the MH17 recovery operations, staging from bases in the United Kingdom and the Netherlands to provide close support to investigators and backup for further crisis or contingency.” Less than four weeks later, according to Brown, one hundred of these men were moved to Iraq instead. Australian troops in Iraq in August 2014. No photograph or press report of Australian troops in Ukraine at the time has appeared. This week’s report by Brown breaks news in identifying how large the Australian force was to have been. He does not report the Dutch, German and NATO planning which was going on at the same time. When asked, Brown declined to say whether he and his sources knew, or didn’t know, that Abbott was acting in concert with the others. 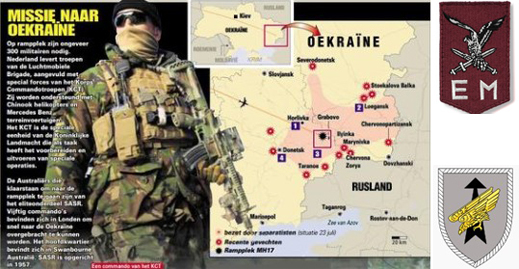 On July 25, 2014, the Dutch newspaper De Telegraaf reported that the 11th Airmobile Brigade (unit flash, below right, red) was being mobilized for action in eastern Ukraine. That’s 4,500 troops, and part of a division-sized German military force called Division Schnelle Kräfte (Rapid Forces Division – unit flash, silver) of about 9,000 men. The cover story, according to the Telegraaf, was “to ensure the 23 Dutch crash investigators and 40 unarmed military police officers can do their job.” The real objective, according to one of Telegraaf’s sources, was: “if our commandos are there, they should certainly try to arrest those responsible. [Russian] Colonel Igor the Terrible Girkin [Strelkov] and his associates.” For background on Girkin’s role in Russian plans and operations in eastern Ukraine, read this. The omissions in the Dutch and now the Australian report suggest the close coordination of US and EU officials on introducing new sanctions against Russia immediately after the MH17 crash was not matched by coordination of any kind between the Obama Administration, the US command of NATO, the Dutch, Germans and Australians. To Russian observers this is not credible. Preposterous, they believe, is that the Dutch and the Australian governments, at the urging of the White House, went as close as they did to war on the Russian frontier. Brown refuses to answer. Was it possible for two prime ministers, the Australian and the Dutch, to start mobilizing for a combined Ukraine operation without US and NATO participation in the planning? Brown won’t say. 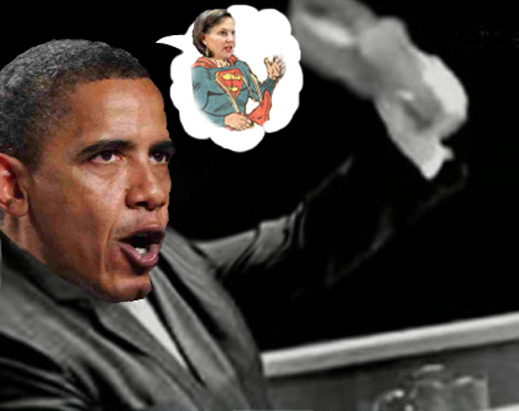 Note: The original and only shoe-banging moment of international significance occurred on October 12, 1960, when Nikita Khrushchev, then First Secretary of the Communist Party Central Committee and chairman of the Soviet Council of Ministers, reacted at the UN General Assembly to criticism by the head of the Philippines delegation. The record of whether Khrushchev banged or brandished his shoe is ambiguous.